InnovationFatigue.com is the site to support Conquering Innovation Fatigue, the new book by Jeff Lindsay, Cheryl Perkins, and Mukund Laranjikar (John Wiley & Sons, July 2009) that gives innovators and those who depend on innovation the inside edge for success. This blog is maintained by Jeff Lindsay, with contributions from his co-authors Cheryl and Mukund. We believe that talk about innovation is cheap, but actually driving it and encouraging it requires significant effort, passion, courage, and street smarts. Leaders need to know what’s happening on the streets, or within the ranks of their innovation community. 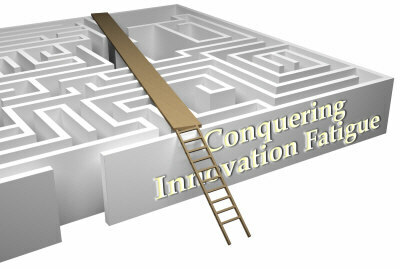 In spite of corporate and government efforts to encourage innovation, there can be numerous unintended or easily overlooked “innovation fatigue factors” that stand in the way of the individuals who wish to innovate. The personal side of innovation is what many leaders and experts miss. The bonds of trust and loyalty that encourage employees to share their best ideas with their organization can easily be broken – an invisible innovation killer. The confidence to innovate and launch a new business in any given nation can evaporate due to concerns over tax policies or regulatory burdens, even when that nation is actively seeking to promote innovation and business growth. The motivation to publish one’s work in a patent for all the world to learn from can erode when intellectual property rights become weak, leading inventors to keep their ideas secret and possibly undeveloped. The individual innovator must never be forgotten if innovation is to fluorish. This book is for them and those who need them or wish to help them succeed. Their success is, after all, vital for the success of all of us. They are the ones who will transform this world into a better, healthier, more prosperous place – if only given the right encouragement.